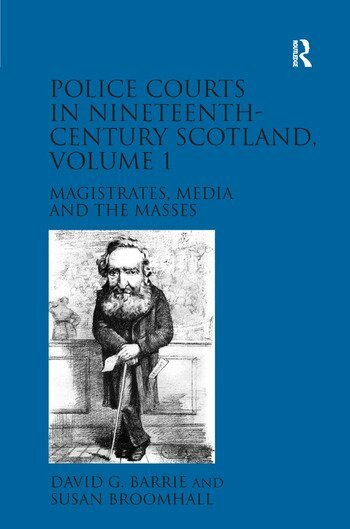 Taking the form of two companion volumes, Police Courts in Nineteenth-Century Scotland represents the first major investigation into the administration, experience, impact and representation of summary justice in Scottish towns, c.1800 to 1892. Each volume explores diverse, but complementary, themes relating to judicial practices, relationships, experiences and discourses through the lens of the same subject matter: the police court. Volume 1, with the subtitle Magistrates, Media and the Masses, provides an institutional, social and cultural history of the establishment, development and practice of police courts. It explores their rise, purpose and internal workings, and how justice was administered and experienced by those who attended them in a variety of roles. Special attention is given to examining how courtroom discourse was represented in print culture, the role of the media in providing a discursive commentary on summary justice, and the ways in which magistrates and the police engaged in a law and order dialogue with the press. Throughout, consideration is given to uncovering the relationship between magistrates, the courts, the police and the wider community, and to charting the implications of the rise of summary justice and the ’police-man’ state for the urban masses (as evidenced through prosecution, conviction and punishment patterns). Volume 2, with the subtitle Boundaries, Behaviours and Bodies, explores, through themed case studies, how police courts shaped conceptual, spatial, temporal and commercial boundaries by regulating every-day activities, pastimes and cultures. David G. Barrie is Associate Professor of British History at The University of Western Australia and Susan Broomhall is Professor of Early Modern History at The University of Western Australia.